Notifications will be added as they become available. Items will be added as they become available. 2015 Urban Water Management Plan – This plan presents a picture of the valley’s water situation through the year 2050. 2017 Santa Clarita Valley Water Report – This annual report provides current information about the requirements and water supplies of the SCV. 2018 Santa Clarita Valley Water Quality Report – Complying with the Safe Drinking Water Act, this annual Consumer Confidence Report (CCR) provides information on the quality of water delivered in the SCV. Why form a Groundwater Sustainability Agency? The Sustainable Groundwater Management Act (SGMA) is a comprehensive package of three bills (AB 1739, SB1168 and SB 1319) that provides local water agencies with a framework for sustainable management of groundwater resources, but also empowers them to adopt groundwater management plans that are tailored to the resources and needs of their communities. The goal is to achieve sustainability within 20 years. What is the time frame for formation? SGMA requires that locally-controlled groundwater sustainability agencies (GSA) be formed by June 30, 2017. The GSA will be responsible for adopting a Groundwater Sustainability Plan by January 31, 2022. SCV Water, Los Angeles County Waterworks District #36 and others including the City of Santa Clarita and County of Los Angeles are working together to explore forming a GSA for the Santa Clara River East Valley Subbasin. Why was the SCV-GSA formed? Who are the members of the SCV-GSA? 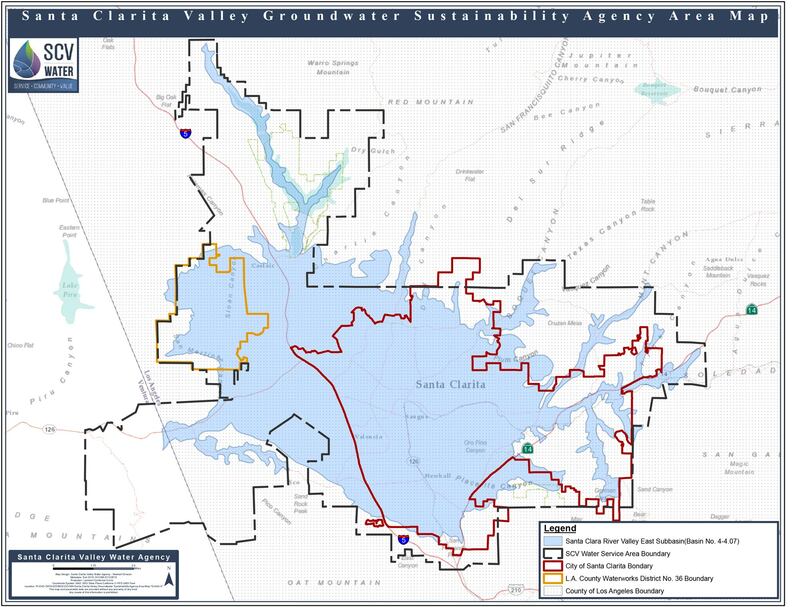 The SCV-GSA includes Santa Clarita Valley Water Agency, City of Santa Clarita, County of Los Angeles Planning, and Los Angeles County Waterworks District No. 36. How is the SCV-GSA governed, and what authority does it have? The SCV-GSA is initially governed through a Memorandum of Understanding (MOU) signed by its four member agencies. A more comprehensive Joint Powers Agreement is anticipated to be approved in the near future. The Joint Powers Agreement will provide streamlined governance for the SCV-GSA by clarifying member financial contributions and administration. The SCV-GSA will be responsible for developing the GSP. To do so, they may adopt rules, regulations and ordinances, conduct groundwater investigations, require registration, metering and extraction reports from individual wells, and assess fees to support creation and implementation of the GSP. Who are the primary stakeholder groups, and what is being done to communicate with them? The SCV-GSA seeks participation from anyone within the boundary of the GSA. You can check your address to see if you live within the GSA: http://yourscvwater.wpengine.com/map.htm. 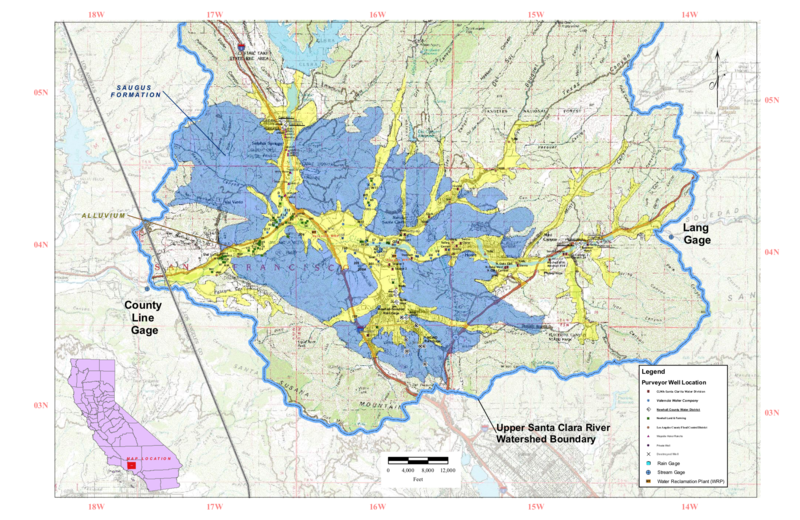 Private citizens, well owners, community organizations, environmental groups and anyone with an interest in the prudent management of our groundwater resources are encouraged to sign up for email notifications here: https://yourscvwater.com/index.php/groundwater-sustainability-agency/. We do not have a comprehensive list of local well owners, however in 2016 we contacted known commercial well owners, as well as sent postcards to areas known to have private wells (Placerita, San Francisquito and Bouquet Canyons, among others.) We encourage people to let neighbors and friends know of this effort. Additionally, late in 2018 a consultant will be on board to develop a Stakeholder Communication and Engagement Plan. This plan will help identify other ways to communicate with interested parties, including well owners. Will the Groundwater Sustainability Plan address existing perchlorate and other sources of contamination in the groundwater? Yes. While it is too early to determine how the GSP will address areas of contaminated groundwater, SGMA requires each GSP provide a description of current and historical groundwater conditions in the basin, including any water quality issues that may affect the supply and beneficial uses of groundwater. What about removing Arundo and Tamarisk, two invasive, non-native species which grow in the Santa Clara River, and use excessive groundwater? The Groundwater Sustainability Plan will consider various plans and management actions to ensure sustainability is maintained over the long term, including removal of invasive species. Is the basin in overdraft? No. A review of long-term hydrograph data for the Alluvial Aquifer and Saugus Aquifer does not indicate overdraft. As expected, groundwater elevations have declined some in recent years, with lower than average rainfall, and groundwater recharge. However, the basin is not in a state of overdraft. How will aquifer recharge be considered in GSP development? The Groundwater Sustainability Plan will consider various plans and management actions to ensure sustainability is maintained over the long term. We anticipate the GSP will consider stormwater recharge and other sources of recharge that can help the GSA best manage the basin for sustainability. How sure is the GSA that adequate water supplies exist?